Cosmoteer 0.13.5 has been released! This is a minor update that should significantly improve the stability of multiplayer games and also fixes a handful of other bugs. Enjoy! Cosmoteer 0.13.4 has been released! The new-and-notable improvements are online multiplayer, increased weapon range, and better ship flight A.I. Until now, to play multiplayer with someone else you had to either be on the same Local Area Network as them, or send them your I.P. address and have them join your game. This made playing with other people online problematic because the host had to first setup port forwarding on their router (which can be a little complicated for someone who hasn't done it before) and then send everyone else their I.P. address (which can be potentially risky). But now 0.13.4 adds "online multiplayer", which allows players to play with others online without having to share their I.P. addresses or setup port forwarding. 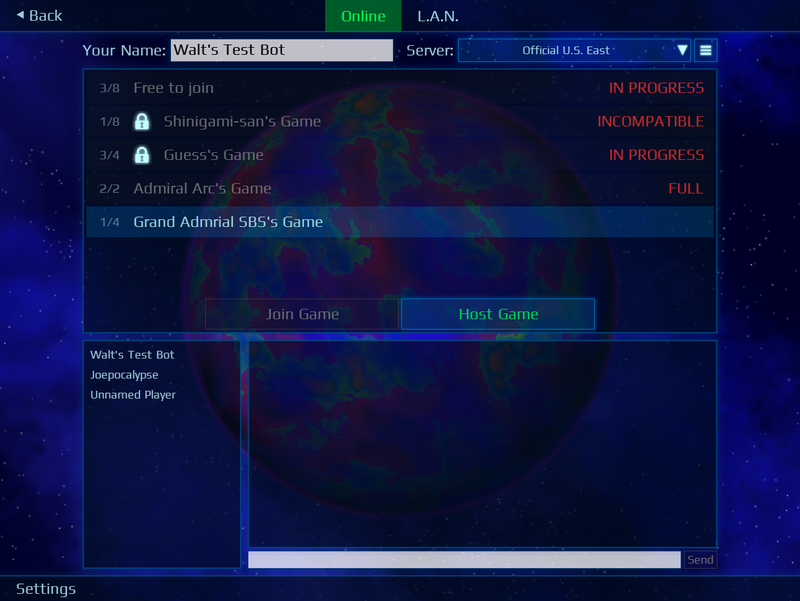 This works thanks to what's called the "Cosmoteer Lobby Server" (or CosmoServer for short), which is a little program that players can connect to and join an online "lobby" where they can then host games and play with anyone else in that lobby, just as if they were on the same LAN. There's currently one official server called "Official U.S. East" (located in New York, NY, USA), but you can also run your own server if you want. Unlike the servers for most other games, CosmoServer does not actually run any gameplay logic; it merely acts as a communication relay between all the connected players, letting the players themselves run the gameplay logic. The advantages of this approach are that it uses far less CPU than a conventional game server, and even more importantly, it is fully compatible with all mods. (Individual players playing games together must still have the same mods, but those mods do not need to be installed on the server.) The primary disadvantage is that it increases latency (not a huge deal in an RTS-style game like Cosmoteer). And if you know anything about multiplayer game programming, you may think that not running gameplay logic on the server would expose the game to cheating, but this is actually not true thanks to its deterministic lock-step multiplayer implementation. Cosmoteer is a game about building pretty much any kind of starship you want, from tiny fighters to huge motherships or anywhere in between. This is great for player creativity, but it turns out to be really hard to design gameplay mechanics that work well for ships of any size. In fact, the single biggest challenge when designing Cosmoteer is figuring out how to deal with the sheer differences in scale between ships. One of the ways in which scale can be a prickly challenge is when choosing the "range" for each weapon (how far it can shoot). The goal is to pick a range that is close enough so that two ships fighting can both be seen on the screen at the same time (without zooming so far out that you can't tell what's going on) while not so close that it feels like the ships are sumo-wrestling. The big problem here is that the ideal range for small ships is much closer than the ideal range for large ships. Until now, Cosmoteer has leaned towards picking weapon ranges that are ideal for small ships because that made the game more understandable for new players, but that of course meant that large ships would tend to fight more closely than felt comfortable or intuitive. The range of all weapons has been increased, most by about 50% (the missile launcher being the most notable exception that got a much smaller buff). These increases makes large capital ships choose longer default attack distances. The collision avoidance algorithm has been overhauled (again) to fix a bunch of problems it had when detecting potential collisions and evading them. When a ship is commanded to attack an enemy from a specific angle, the ship will now approach the enemy straight-on until it reaches attack range and only then attempt to move to the correct angle. This change prevents ships from entering combat facing the wrong direction, which was frustrating for many players. Lastly, the thruster calculation algorithm now prioritizes lateral thrust 50% more than it does forward/reverse thrust, meaning that ships will now try to eliminate most lateral motion before thrusting forward towards their intended destination. This has the practical effect of preventing most cases where ships would "orbit" around their destination without ever actually arriving at it. Cosmoteer 0.13.3 has been released! When I released 0.13.2, I made a mistake which made many existing mods incompatible with Cosmoteer, much to everyone's dismay. This update restores compatibility with those mods and also fixes a handful of bugs. Cosmoteer 0.13.2 has been released! This is a relatively minor update that fixes bugs, reduces RAM usage, and adds some quality-of-life improvements and modding tools. The reduction in RAM (and VRAM) usage is largely because Cosmoteer now uses "texture compression" to reduce the size of almost all of the graphics textures by 75%. This saves a couple hundred MB of RAM in the vanilla game, and it makes an enormous impact for some mods: "Abh Mod" for example has gone from using more than 4 GB of ram to around 1.2 GB of RAM. Most games use texture compression and package already-compressed textures as part of the game installation. But Cosmoteer is a bit different in that it compresses textures on the fly from the raw PNG files during loading. It does this primarily to keep the game very easy to mod (most paint programs are unable to save textures using GPU-compatible texture compression formats, and none can generate the texture atlases that Cosmoteer uses for its ship graphics). The downside is that it takes much longer to compress a texture than it does to load an uncompressed texture, and so after compressing a texture for the first time, Cosmoteer caches the compressed texture on your hard drive and only re-compresses it if the original PNG file has changed. This update also adds a "Developer Mode" to Cosmoteer, which makes available a number of development tools and features that should hopefully make mods easier and more convenient to create. These tools include a particle effect editor, a planet editor, and the ability to "cheat" by giving yourself money and fuel.